240V mains voltage lighting is becoming increasing popular within the kitchen as it does not require an LED Driver whilst still giving the same levels and quality of light. This Mains voltage surface mounted triangle light certainlly helps you to acheive this with its modern satin silver finish and design. 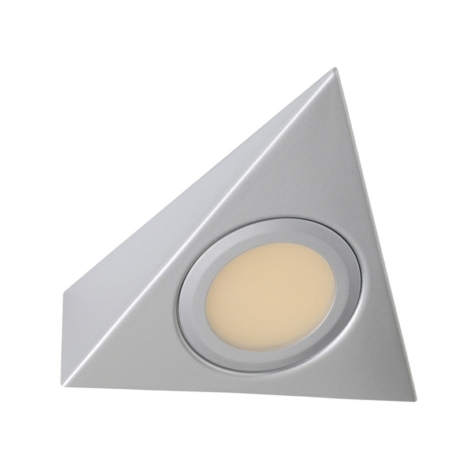 Inkeeping with its modern look and feel the light comes with a opaque diffuser and uses the very latest LED technology to give you a high quality LED downlight. The light is fitted with COB (Chip on board) chip. Does the whole lamp have to be replaced when the LEDs start to fail or are the LEDs replaceable? No just the centre part of the fitting. Are these lights prewired, I wish to wire 6 in series.